Snippet: “Emma,” Julian whispered. “Your Marks . . .” She shook her head, tears bitter in the back of her throat. "It’s done." This better not be what I think it could be Emma needs to keep her Marks, she needs to stay a Shadowhunter! What do you think? Sound off in the comments below – let’s freak out together. WHAAAAAAT? OMG i’m completelly freaking out. What the hell is going on? She’s being exiled? She’ll die? Omg omg omg … please dont be what I think it is.. 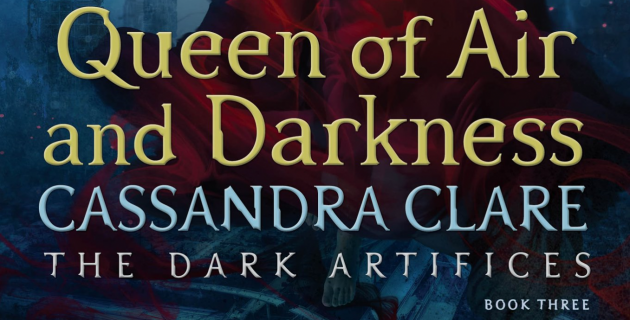 I cannot believe what this snippet is suggesting but then it’s Cassandra Clare, anything can happen, folks, anything at all. I’m spooking out, by the way. I think the Marks disappearing is a consequence of the curse, without the Clave’s influence. The Clave doesn’t even know why they have the Parabatai law. I think the Parabatai bond may have demonic, or partly demonic origins (half demonic, had angelic…like the Fae) and falling in love activates the demonic power, or strengthens it as perhaps the extra power itself is demonic. It eventually gets to the point where demonic influence fully takes over, hense the loss of runes, Iike Annabel (which leads to the question, did she fall in love with her Parabatai [if she’d had one…maybe a Dearborn or even Herondale? She married him, explaining her missing ]ring finger cut off in desperation to stop the curse – and why she ended up murdered. Malcolm’s love could have been more – in time – intense infatuation with what was happening to her and why he experimented on her/tortured her.] which gave her so much power she destroyed that Alicante-like city now in Edom, even its original Shadowhunter-like race – so she’s the only existing member of that race. She could be why that law exists, as a means to prevent that from happening again. But with the recreation of the Shadowhunter race, no Shadowhunter knows why the law exists. The entirety of Shadowhunter kind seems to be getting corrupted by demonic power. So was the creation of Shadowhunters may have been in a pact between angels and demons. And the Clave’s actions are pulling them further to being more demonically infuenced, which has begun the Blight. The more the Parabatai ceremony is done, the more powerful by demonic influence it is. What if Emma dies. Remember that unidentified snippet somewhere“… All that effort to convince you I wasn’t in love with you, and here I am dying in your arms.“ what if it refers to Emma n Jules . 😨😭. I still don’t understand how cortana can break the bond. I just wish m not correct n it ends in a happy note. Omg I cannot WAIT for the 4th! !